In this competitive age an effective sales organization is supported by marketing assets and includes a proper sales structure. The sales organization and governance must be designed to optimally support sales targets and create visibility into the sales team’s performance to allow for adjustments and course corrections as necessary to ensure that the business meets its sales revenue objectives. Since sales targets are directly linked to all sales and marketing and financial objectives, they are essential components in the achievement of company’s overall objectives. Most experienced sales teams have an existing sales process. If this is the case, it is important to constantly evaluate, improve, and fine tune different components of the process. A new company, however, must define a sales process by adapting established frameworks to suit the specific needs of the business, leveraging identified strengths, and identifying and filling gaps. Pre-sales—This first step in the sales process involves reviewing the current activities and selling processes. These activities include those carried out from the initial contact with a customer to the final delivery of a product or service. This step allows a developing company to assess its organizational capabilities to carry out the sales process. It includes understanding and strengthening the value proposition for customers. The different channels required to sell products in the future are also determined. Planning sales governance, setting sales targets, setting up the incentive structure for the sales team, and creating the marketing assets is also done at this stage. The sales team is also trained on products as well as the sales process and negotiation to prepare for selling activities. Profiling of Target Customers—The first step in the prospecting stage, profiling target customers and decision makers, involves identifying and benchmarking profiling criteria for prospects, as well as decision makers. Characteristics of ideal customers, such as annual budget, are used to benchmark the profiling criteria. 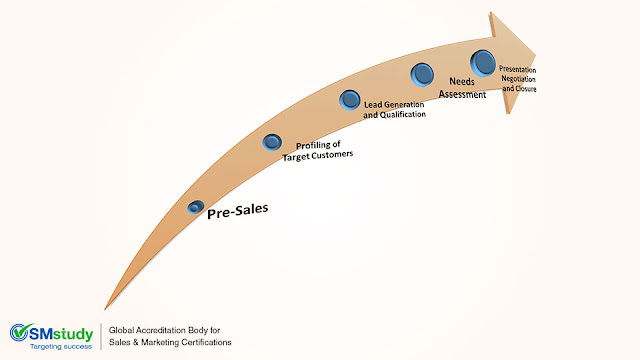 Lead Generation and Qualification—The second step in the prospecting stage, lead generation, is the act of identifying prospective customers and generating ways to gain new customers. Profiled criteria and benchmarks are used to generate better leads. Lead generation uses various offline and online techniques and can be inbound or outbound. Needs Assessment—Conversion starts with understanding customer needs for products or services. This understanding of needs is vital in the conversion process and enables the sales team to demonstrate to the customer how their product can fulfill the customer’s requirements. Presentation, Negotiation, and Closure—This is the final stage in the conversion cycle. The corporate sales team presents the features, benefits, and advantages of the proposed products or services that can fulfill the needs of the prospects. At this stage, prospects present their objections to the sales proposal. It is the job of the corporate sales team to overcome these objections to close the deal. Understanding these five steps and adapting them to suit the business requirements will help establish a framework for a comprehensive and effective sales process.